Many tour operators are now fretful over the Tourism Law just passed by the National Assembly, since thousands of them may be forced to attend school again to meet higher requirements. The law specifies that bosses of travel firms or heads of travel departments at tourism companies must at least obtain a college diploma in travel services or a certificate on travel management. The current Tourism Law only requires people in such positions to have at least three years of experience. Chapter 5 of the law requires that those people in charge of managing travel services must have a certificate on international or domestic travel management, in case they do not have a college diploma in travel management. Those advocating the new regulations say that travel is a special business sector directly related to people’s safety, so there should be regulations on stringent qualifications. The rules in some other countries are even stricter, so provisions in the draft are suitable to the country’s current conditions, they assert. Others, meanwhile, oppose the rules, saying the prevailing laws already have provisions designed to protect and safeguard the rights and interests of customers, so new regulations would be bothersome to them, especially those wanting to enter this industry. Nguyen Duc Chi, vice manager of the Travel Management Division under the HCMC Department of Tourism, supports the new rules. 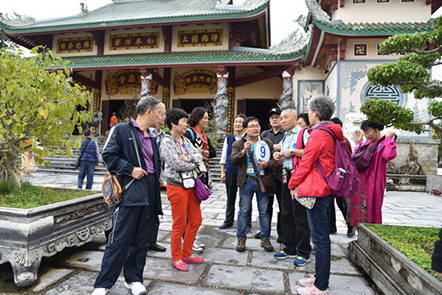 Chi says that experiences are necessary for tour operators, but people assuming such jobs must also wield deep knowledge manifested by professional qualifications and degrees. Training courses in this regard often include not only travel operations, but also legal provisions governing this business, so it is imperative for such people. “In reality, several companies infringing travel regulations often say they do not know of such regulations. Therefore, the new rules will prevent such violations and help improve service quality,” he asserts. Meanwhile, many others, especially owners of small private firms and startups, reason that there have existed many other rules safeguarding the interests of customers. They say the new rules can hardly help them improve business practices. In reality, many private firms are performing well in the travel segment though their bosses do not have such qualifications. Enterprise owners explain that before starting up a travel business, entrepreneurs must conform to various laws, including the Enterprise Law and the Tourism Law, and place a deposit of hundreds of millions of Vietnam dong to settle all problems happening to customers. They are also forced to buy insurance for customers. As such, the new rules approved by the National Assembly will only cost businesspeople more time and money as they are forced to return to the classroom again. Tran Van Khoa, director of Jack Tran Tours, says more qualifications can help an enterprise improve business management, but such rules are not necessarily made into the law and become conditions when licensing an enterprise. According to him, management experiences and good initiatives on travel services rather than qualifications will help an enterprise do better. In HCMC alone, there are about 1,000 tourism firms, and the majority of directors or managers of travel services at such companies do not have formal degrees or qualifications on travel management. As the law has been formally passed, it is anticipated that many of them will have to return to school; otherwise, their enterprises will have to undergo personnel changes.